There is no shortage of sedentary moments in a classical musician’s life. Whether they’re down in the orchestra pit or up on the stage, chances are, they’re sitting. Not so with the Scottish Ensemble, who not only perform standing up but can often be found with a sway in their hips or spring in their elbow. So it’s no surprise to find them collaborating with dancers on their latest project. Swedish company Andersson Dance has joined forces with the Ensemble to create a new interpretation of Dmitry Sitkovetsky's arrangement for strings of Bach’s Goldberg Variations. 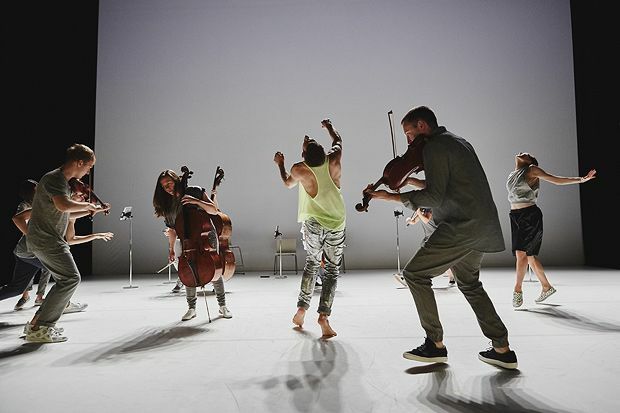 To an outsider, it might look like 11 musicians sharing a stage with five dancers, but choreographer Örjan Andersson doesn’t see it that way. So ubiquitous is the Goldberg Variations, everyone would recognise at least part of it, which proved an exciting challenge for Andersson. Sitkovetsky's arrangement of Bach's mesmerising Goldberg Variations is performed by 11 musicians of Scottish Ensemble and five dancers from Andersson Dance.